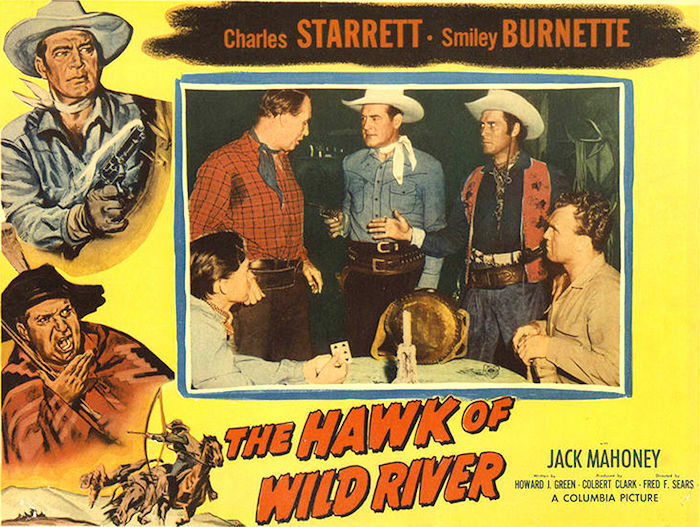 Mill Creek Entertainment | 50 Westerns From The 50s. 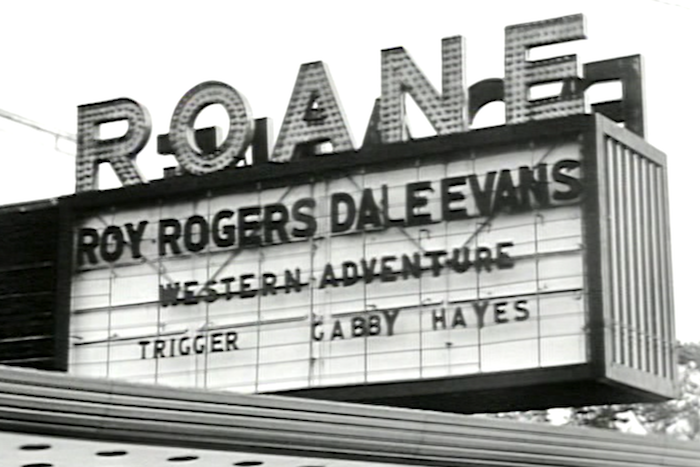 DVD Review: Battle Of Rogue River (1954). 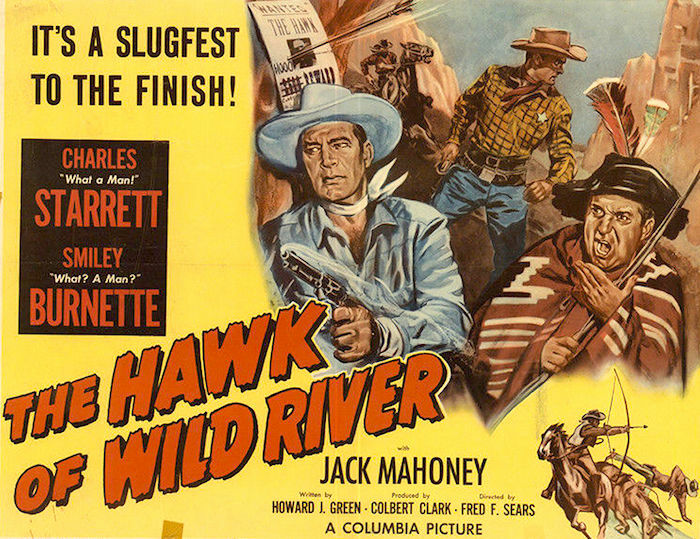 Battle Of Rouge River (1954) is another William Castle Western produced by Sam Katzman for Columbia. 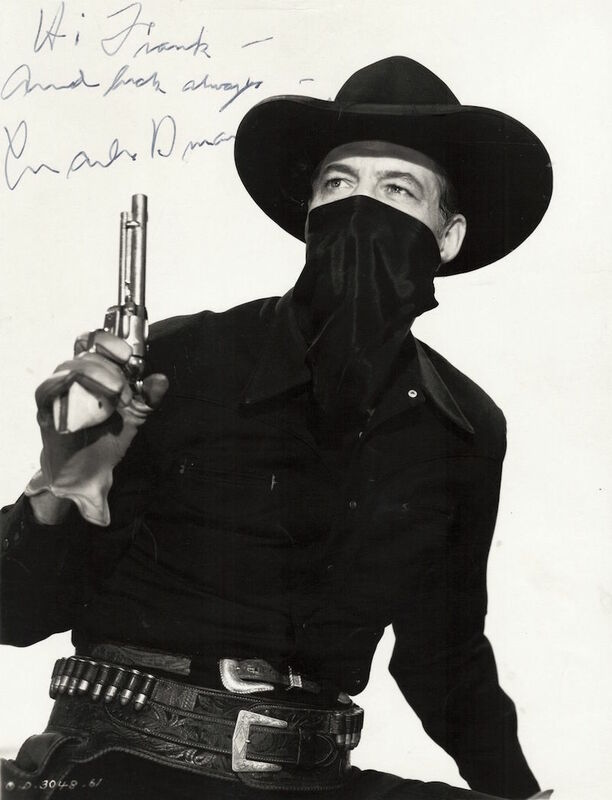 It’s part of Mill Creek’s terrific eight-movie DVD set The Fastest Guns Of The West: The William Castle Western Collection. 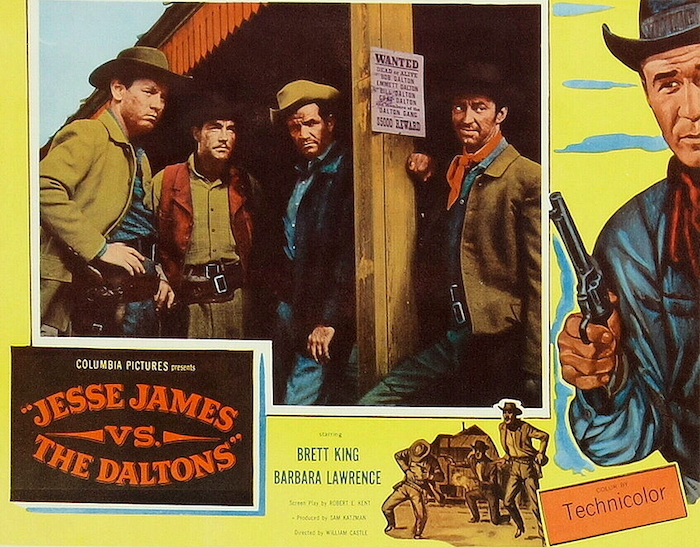 Also included are Klondike Kate (1943), Conquest Of Cochise (1953), Jesse James Vs. 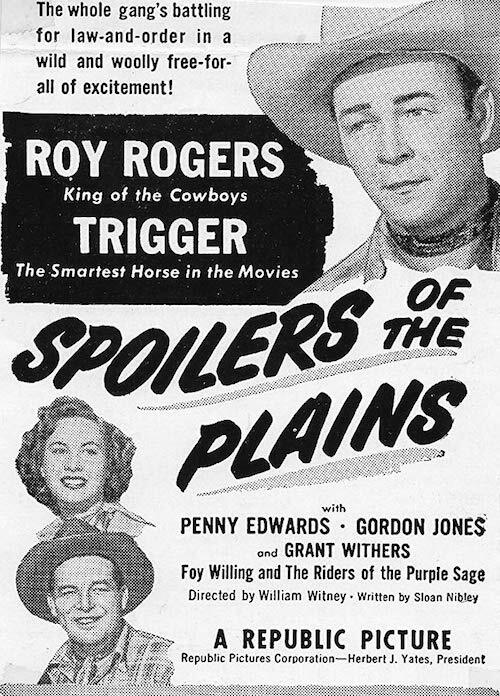 The Daltons (1953), Masterson Of Kansas (1954), The Gun That Won The West (1955), Duel On The Mississippi (1955) and Uranium Boom (1956). All eight for less than $15. 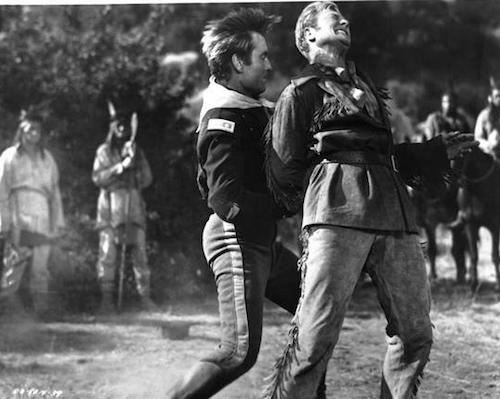 At an outpost in the Oregon Territory, the stiff, serious Major Archer (George Montgomery) replaces Major Wallach (Willis Bouchey), who hasn’t been able to defeat Chief Mike (Michael Granger). Archer meets with the chief and they agree to a 30-day truce that keeps them on either side of the Rogue River. 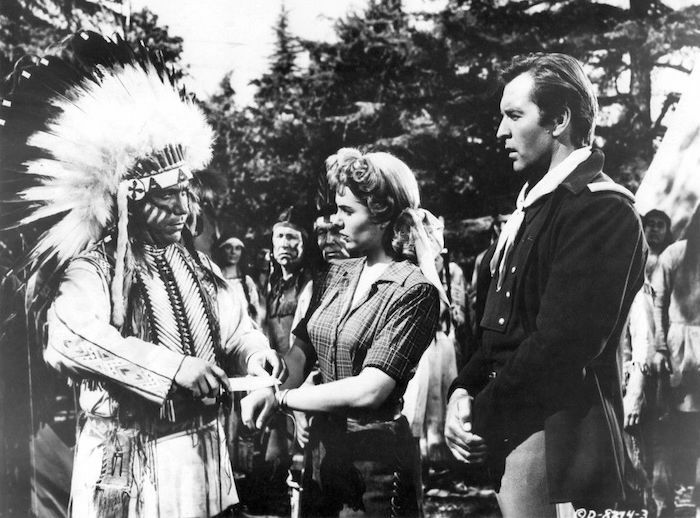 Of course, there’s a woman — Brett McClain (Martha Hyer), the daughter of one of the solders at the fort. But one of the Irregulars aiding the soldiers (Richard Denning) is working to keep the Indians stirred up — to hold off Oregon’s statehood, which would spoil a good thing some of the area businesses have going. Denning tricks Montgomery into breaking the truce and attacking the Indians. 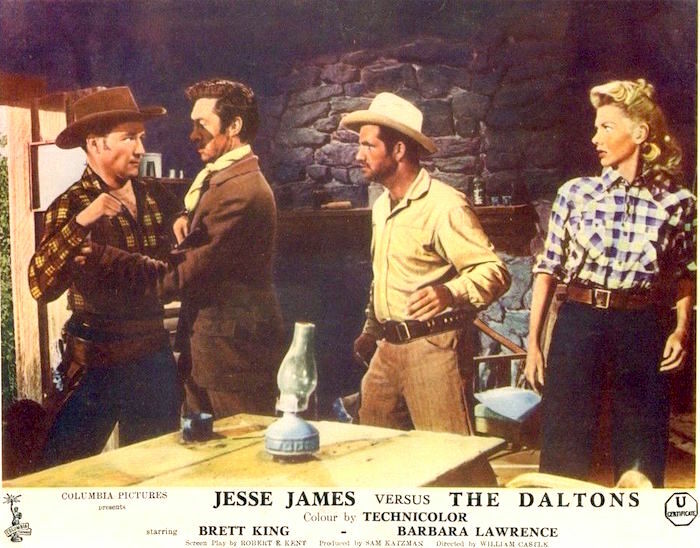 George Montgomery was on a roll at this time, making one solid little Western after another, often with William Castle as director. 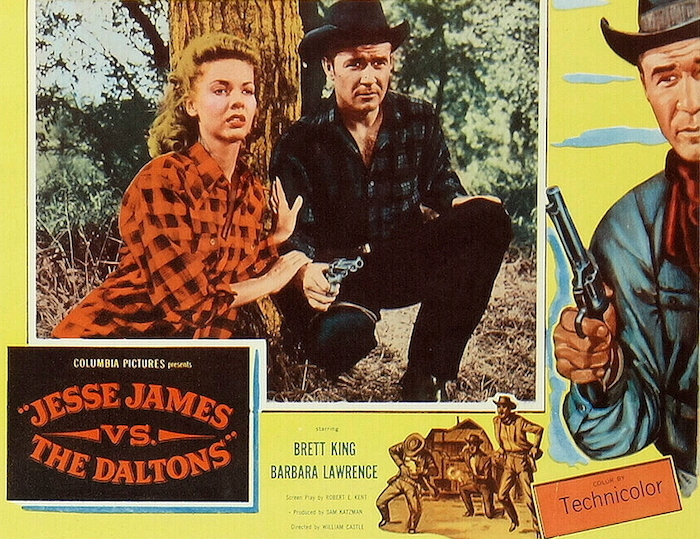 For me, Masterson Of Kansas (1954, directed by Castle) and Robber’s Roost (1955) stand out. Martha Hyer’s career was also taking off at this time, and she’d be nominated for an Oscar for Some Came Running (1958). Richard Denning was in the excellent Hangman’s Knot (1952), playing pretty much the same creep he is in this one. The first thing I remember seeing Denning in was Creature From The Black Lagoon (1954), along with all those sci-fi pictures like The Black Scorpion (1957). Later, I’d come to know him as the governor of Hawaii on Hawaii Five-O. Denning was married to the beautiful Universal horror star Evelyn Ankers. 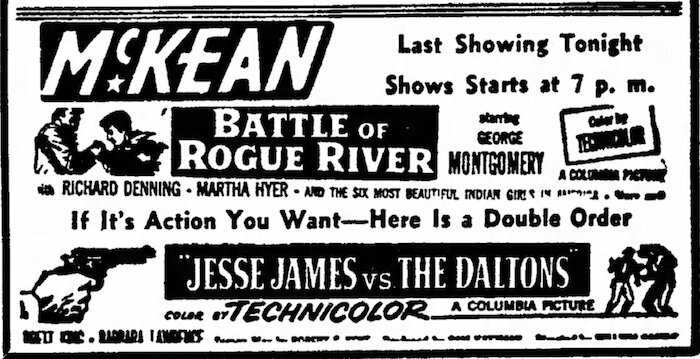 Battle Of Rouge River has the hallmarks of a Sam Katzman picture — a running time of about 70 minutes and lots of stock footage. It also boasts a pretty tacky gimmick. 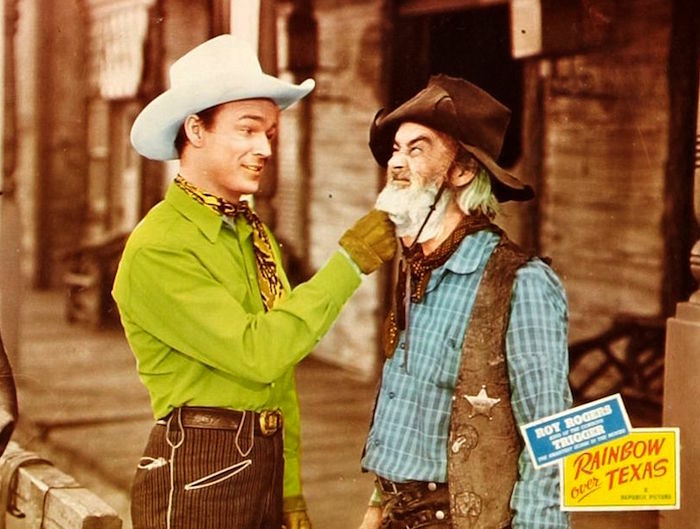 Willam Castle always gave Sam Katzman credit for teaching him the true value of showmanship. 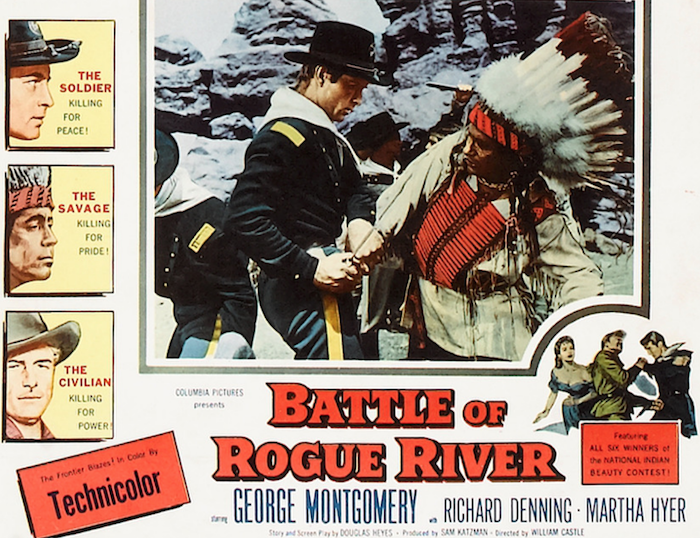 Battle Of Rogue River seems to be an example of one of those lessons. According to the ads, you’ll find “all six winners of the National Indian Beauty Contest” in its cast. 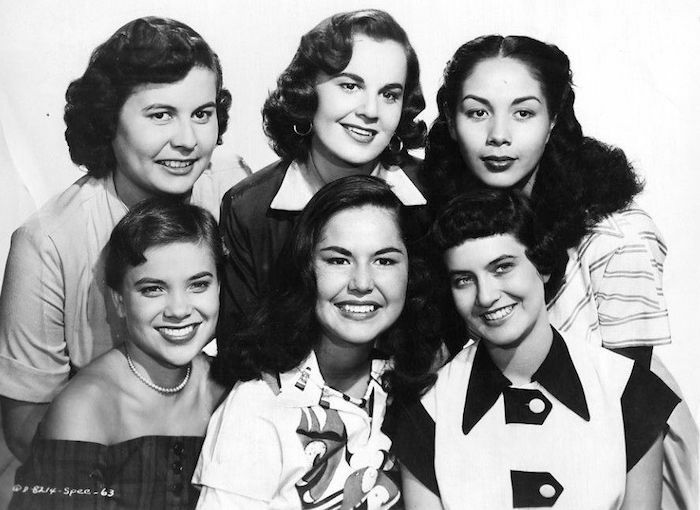 The contest did not exist until this movie came along — and you have to look really hard to find these lovely ladies in the film. 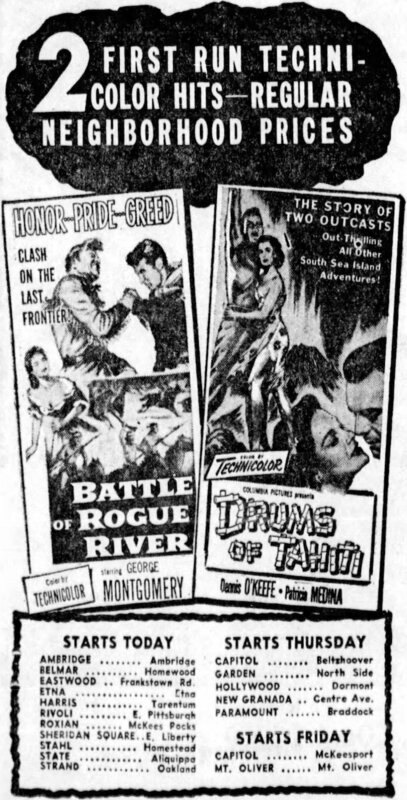 Battle At Rogue River isn’t among Castle or Montgomery’s finest work. But it’s got a cast and crew of seasoned professionals who I’m always happy to spend time with. Cinematographer Henry Freulich always had these cheap things looking great, and that’s easy to see in the transfer offered up by Mill Creek. I can’t recommend this set enough. 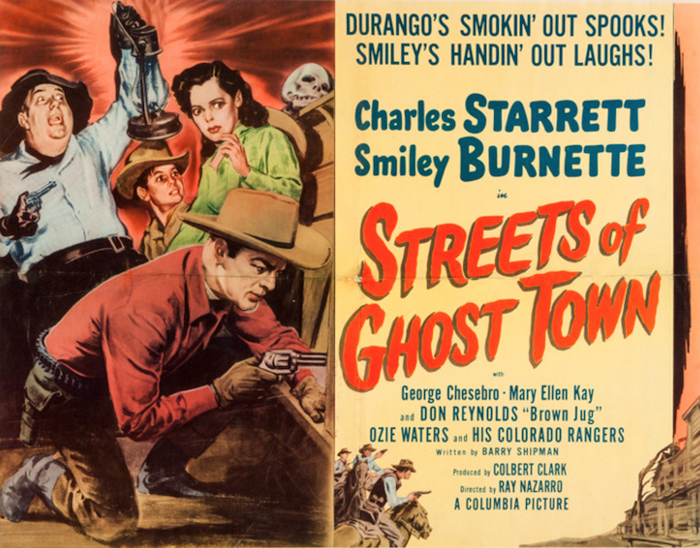 DVD Review: Streets Of Ghost Town (1950). 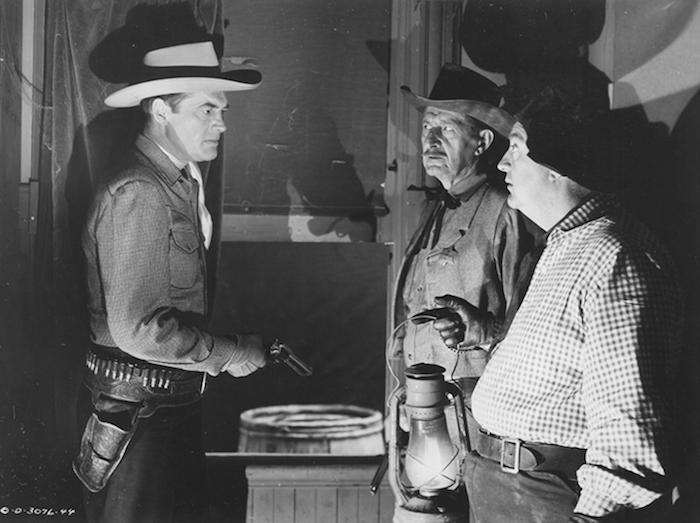 Mill Creek has done us a big favor by scooping up 10 of the 60-plus Durango Kid movies and putting them in one extremely budget-friendly two-disc set, The Durango Kid Collection. 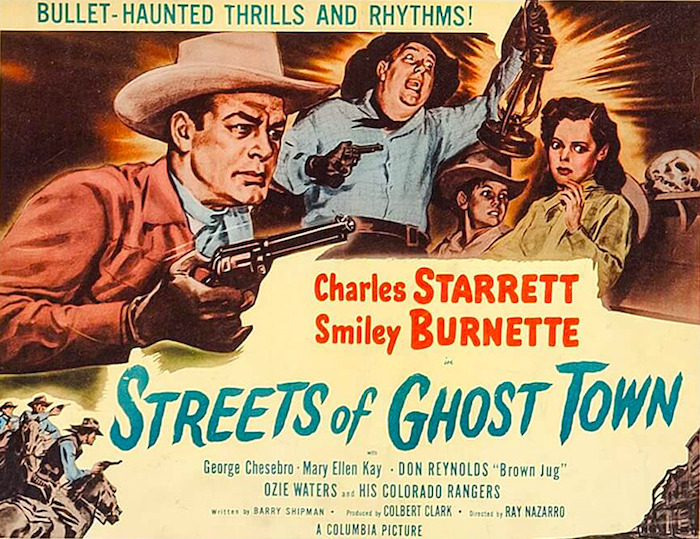 One of the 10 is Ray Nazarro’s Streets Of Ghost Town (1950). 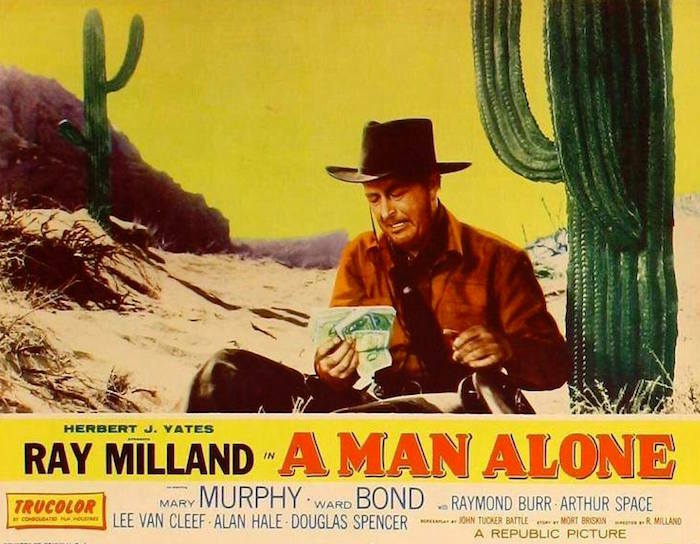 In this outing, Steve and Smiley help ​the ​sheriff of Dusty Creek ​(Stanley Andrews) look for a fortune in stolen money supposedly hidden in a​n old​ ghost town — boarded up, littered wth tumbleweeds and creeking and moaning just enough to keep Smiley scared. A good chunk of the picture uses flashbacks to fill us in on how the treasure was stolen by Bart Selby (Frank Fenton, wearing a hat that seems too small for his head) and his gang, then ​taken by ​the double-crossing Bill Donner (George Chesebro). 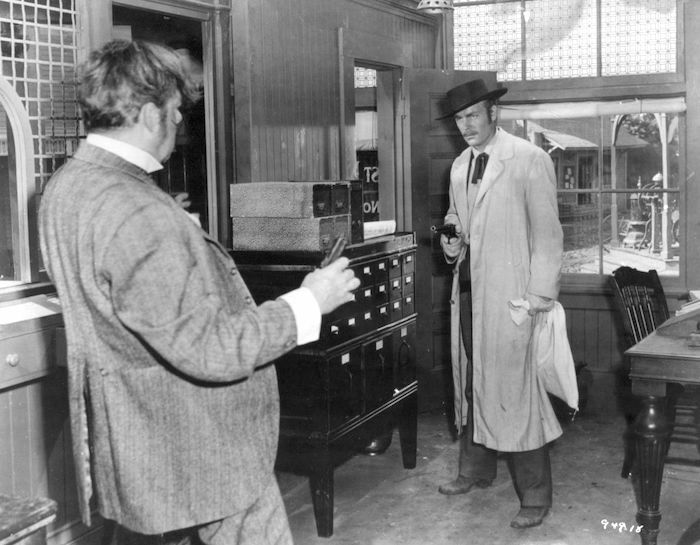 Back in the “present,” Selby and his gaggle of crooks are looking for the loot, and it’s believed Bill Donner is dead. Then Donner’s niece (Mary Ellen Kay) and nephew turn up to complicate matters. 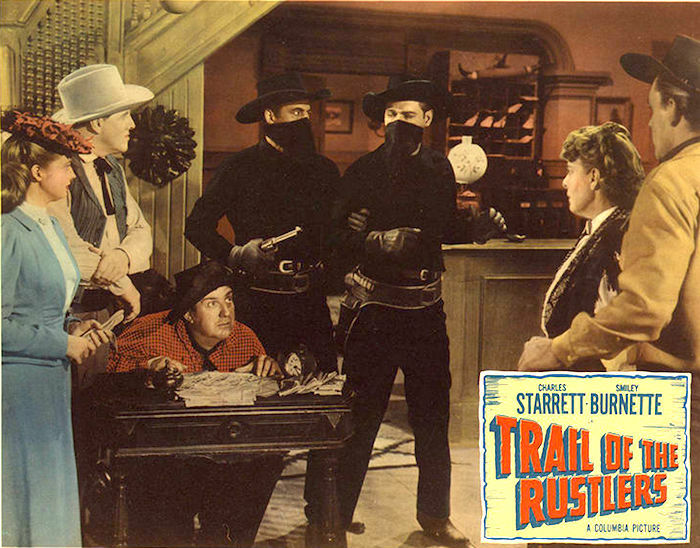 This is no Riders Of The Whistling Skull (1937), but it handles its mystery elements pretty well. The Devil’s Cave, where the money’s hidden, is pretty cool, especially when Donner locks a couple of his cohorts in there with the treasure to die a slow death. And Smiley working a Ouija board is a pretty odd sight. The cinematography by Fayte Browne looks terrific, with lots of deep shadows to crank up the spookiness. Ray Nazarro directed over half the Durango Kids (he did half of this set), and he keeps Streets Of Ghost Town running like a well-oiled machine. 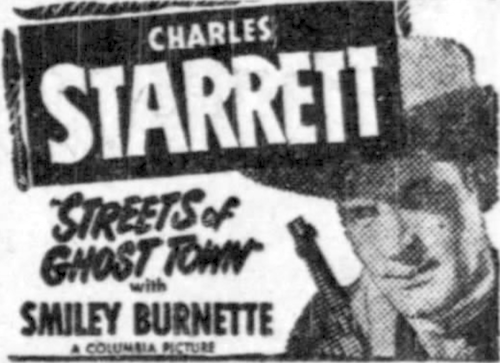 Charles Starrett is as likable as always and looks cool, and Smiley Burnette is, well, Smiley Burnette, which certainly works for me. George Chesebro is wonderful as the crazed, double-crossing crook. What bothers me about The Durango Kid pictures is the Kid himself — he often seems nailed to the action like an obligation. But he sure looks terrific tearing through the ghost town on Raider. 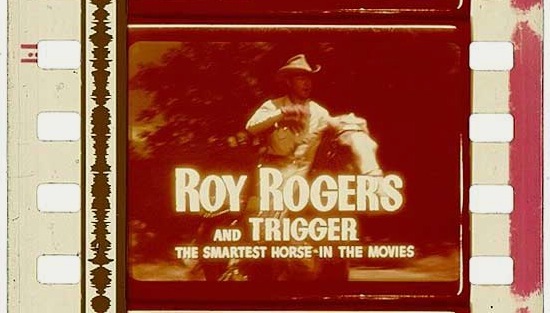 The same Durango Kid titles that make up this set have been available from Columbia on DVD in the past, sometimes at up to 20 bucks a piece. So the economics of this set are pretty solid — and it’ll sure save you some shelf space. You can count on Columbia for terrific transfers of these older titles, and these don’t disappoint. (I love the fact that there’s some dust and dirt to remind us what film used to look like.) Recommended. So with 10 of the series pulled together for this nifty set, when can we count on volumes two through seven?